Mary Morrissey Introduces A NEW Prosperity Program That Will Enrich Your Congregants’ Lives, AND Your Church Tithes! You are going to love teaching Prosperity Plus! Claim THREE Prosperity Teaching Lessons Your Congregation Will LOVE! This cutting edge program by speaker and minister, Rev. Mary Morrissey, shows individuals how to create abundance in every area of their life, how to open up to new wealth possibilities, and at the same time support their church as they tithe 10% of their income during the course. ...So they make tithing a priority year after year! How to attract more abundance, effortlessly! Prosperity Plus is a dynamic, easy-to-instruct, video based 10-week program that teaches a new way of living centered on the spiritual practices of an abundant life! In this program, Mary Morrissey teaches you how to positively impact your congregants in a way that allows them to move from fear, scarcity, and limited thinking to a life full of possibility, prosperity and promise. Throughout this course your students will discover the 10 universal laws that govern an abundant life and will be given the opportunity and encouragement to put these universal laws into daily practice. Mary Morrissey has tested this 10-week experiment, and it has proven to be the catalyst for greater self-awareness, deeper spiritual practice, more meaningful relationships, financial increase, and stronger self-esteem. AND your congregants will spend time focusing on living their purpose and giving their biggest gifts to the world. When they complete the program, they will have made new friends and feel more committed and connected to your church than ever before. 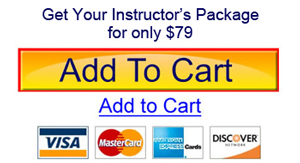 You get everything you need to teach this powerful course. When you sign up, you’ll receive a complete instructors kit which includes: A DVD (video) of Mary Morrissey teaching the prosperity lesson for each week, an instructor’s guidebook with outlines, teaching points, and discussion questions for each class. As the senior minister you can teach this course yourself, or you can have an associate minister, qualified practitioner, or church leader teach this course. 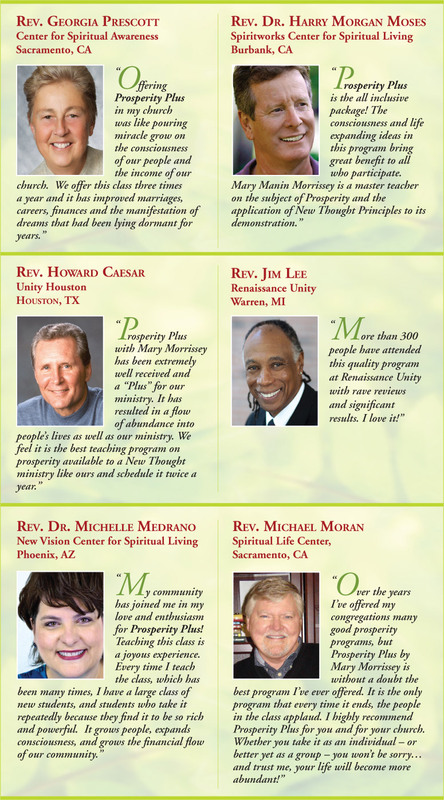 Mary Morrissey and our experienced team, help you fill your Prosperity Plus classes by giving you a full set of marketing materials, bulletin blurbs, pre-written emails to send to your list, a special video announcement from Mary Morrissey to invite your congregants into the class, fliers, and newsletter ads! We have created everything you need to have a successful and thriving Prosperity Plus class. Often there is a buzz created from Prosperity Plus, and congregants who didn’t take it are left wondering what they missed, and eager to sign up for the next time. And you will have everything you need to run this class again and again and get everyone on board who is enthusiastic about the new discoveries to be made! So What Makes Prosperity Plus Different From Other Tithing Programs? 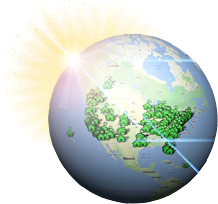 Prominent churches across the Nation are saying, "Prosperity Plus is a new program for a new time!" Students understand the concept of tithing on a new level and are motivated to continue the giving when they see tangible results in their lives. Yes, this course is a blast to take and even more fun to teach! The videos and exercises take participants on a journey of creating their best possible life. They will walk away with a vision for their lives, as well as the inspiration to give their gifts and live their purpose. Prosperity Plus doesn’t just teach your congregants about tithing, it outlines and explains the universal laws of prosperity that come into play for them when they start living from an attitude of giving. They will understand the fundamentals of exactly WHY tithing works to bring about more abundance, and they will be devoted to this practice for 10 full weeks so they will start seeing the results of their commitment DURING the class! How does Prosperity Plus work? Each participant begins the course by making a full commitment to the Prosperity Plus program. Tithing 10% of their income to your church during the 10-week course. promote and teach in the church market today!" What does the Prosperity Plus program include? Click Image to Zoom In! An easy-to-follow instructor’s guide complete with week-by-week lessons, processes, and questions to lead your class through spirited discussions and positive breakthroughs. 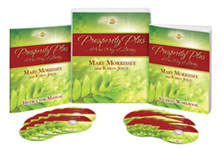 A 10-set DVD series (one DVD for each class) from best-selling author and master teacher Mary Morrissey. Each week your students will see an engaging lesson from Mary Morrissey and her faculty about that week’s prosperity principle helping them to anchor what they’ve learned and better understand how can apply these spiritual principles in new ways. Now you can have a world-class teacher, by your side, helping you to teach this life-giving course. The course curriculum for each student includes: 18 audio CD's, an interactive guidebook to reinforce the principles, learning, and life-changing insights. Registration forms, a covenant agreement, and personal vision cards. Students feel supported and empowered when they write and carry their Dreams, and Goals on their personal Vision cards. Their dreams become realized as they listen to the daily teaching audios and put their lessons into action with their class homework. Also included is a surprise gift your students will LOVE! Click an Image to View Samples of Marketing & Class Materials! The church agrees to pay LifeSOULutions a 10% share (a tithe/royalty) of the total amount tithed to the church by the participants during the Prosperity Plus program. Plus these high value Bonuses! The Nations top marketing and sales masters worked together to bring you the best, proven materials to market and fill your class! Attractive bulletin blurbs, and more! Included is thousands of dollars worth of marketing materials, copy writing, graphic design excellence, and genius sales & enrollment strategy! Step 1) Simply click this button below to get registered. You’ll receive your instructor’s package, and Mary’s team will send you all the marketing materials you need to promote the course and make it a huge success for your church and congregation. Step 2) Order as many additional participant packages and guide books as you want by clicking the buttons below. Or, once you know how many participants will be in the course come back and place your order then. As a facilitator, I want to share with you my own personal gratitude for the privilege of facilitating the Prosperity Plus class. Your program and the way you constructed it was the most powerful I have experienced, and I have facilitated many, many different prosperity classes over the last ten years. The blessings overflowed from the amazing manifestations of the students and the many life changing events that occurred during that 10 weeks. Prosperity Plus certainly took my life and my prosperity to another level of consciousness and success. My favorite truth and the one that will stick with me always is, you can never build a vision or a dream from your current condition. It is for me, the single most powerful truth I took from the class. 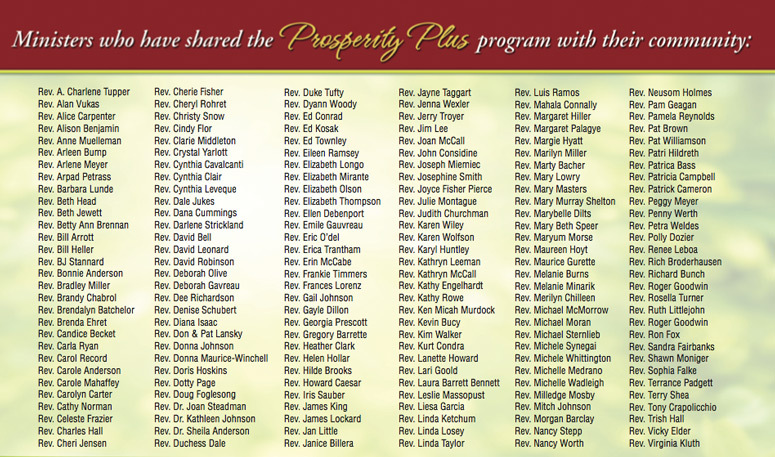 I will definitely be teaching Prosperity Plus again, this year, at Unity Church of Christianity, Houston. We have had incredible financial success through the use of this Prosperity Plus program. What I think of it is that it is probably one of the best that has been presented in recent years. It’s incredibly informative and it includes so much more than just prosperity. Just different ways of seeing life from a more positive perspective. Through Mary’s wonderful wisdom and the way in which she presents the material, the audience is completely engaged. Watching something and listening to something and then re-listening to it through the cds is really a stellar way of doing this. The results I’ve see in our congregation are people learning to tithe time and talent in a significant way. I would highly recommend this to other churches. In fact I have sent every notification of a conference call out to the Religious Science International, International Centers for Spiritual Living Field Web so that people can sign up. People want to talk about it. Participating in this class has opened doors for me that have been shut for some time now. Through tithing, unexpected income has been coming to me on a consistent basis getting me through each month where before I had no idea how I was going to manage. For example, my ex-husband had not been able to pay child support for over a year and a half. While I was enrolled in this class, he became able to pay. And my confidence has grown which is creating new opportunities. Thank you so much! I am grateful and feel very blessed. I am so grateful and fortunate to have taken this journey in Prosperity Plus. I feel more positive, happy, and peaceful as a result of this class, and I’m more excited about my life (current and future) than I have been in many years. Yay! Professionally, I have gone from last place on the sales team to the "top writer" and it’s been my best 2 months since starting this job 3 years ago. I am eager to continue my "dream career" and develop my next vocational step. Thank you so much Mary for sharing your wisdom, and thank you to Unity for making the class possible. I have been working to manifest the money to go to Ireland for a group trip in September, believing it would happen, but it was not going according to my plans... I have been working harder and felt disappointed not manifesting the abundance as hoped for. I remembered Mary's story about tithing from Prosperity Plus and so I tithed 10% of one week’s check on Sunday. Tonight I got a phone call from strange number, which turned out to be a woman from social security in Chicago. She said she received my application this month, and then out of the blue told me, “I can offer you a lump sum retroactive to February if you wish...” which totals about 11,000$! Whoa! Wow! Thank you God! 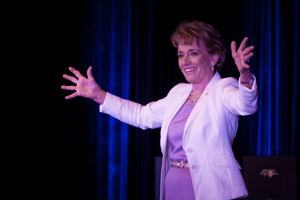 Speaker, best-selling author, and consultant for over three decades, Mary Morrissey gives transformational talks and seminars that have made her one of the elite teachers in the human potential movement. Over the past 30 years, Mary Morrissey has helped churches fundraise millions of dollars and supported hundreds of ministers all over the country increase the reach of their ministry exponentially. While she built one of the largest New Thought Centers in the world, Mary is no stranger to mega success as well as massive failure. In 2004, Mary lost her church and everything she had worked for over the previous 25 years. After this crushing loss, Mary put the Prosperity Principles to the test. Starting from ground zero, and harnessing the Universal power of these spiritual laws, Mary rebuilt her success and great work in the world. 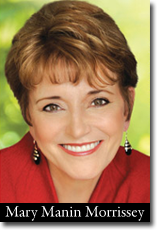 Mary Morrissey is the founder and CEO of LifeSOULutions, a successful international company providing life coach certification programs and products that teach visionaries how to become a life coach, and transform dreams into reality. Mary Morrissey has spoken at the United Nations, met with Nelson Mandela, lead meetings with the Dalai Lama, and authored two best-selling books, No Less Than Greatness and Building Your Field of Dreams. As a highly sought after inspirational speaker, executive coach, and ministry consultant, Mary has 30 years of experience empowering individuals in achieving new heights of spiritual aliveness, wealth, and authentic success. While she holds significant academic degrees, Mary says her two most important achievements are the two black belts she holds: one in success, and the other in failure. Karen Joyce was Mary's business partner in LifeSOULutions. She was an executive coach, successful business entrepreneur and dynamic motivational speaker. In 1999, inspired by the Columbine tragedy, Karen founded AKTNOW, a non-profit organization, creating Acts Of Kindness teams in high schools throughout the U.S. Karen lived by the principles and practices offered in this program every day of her life. Karen made her transition beautifully in the fall of 2011. © 2010 - 2018 Mary Morrissey®, LifeSOULutions That Work®, LLC. All Rights Reserved.